May Day is such a nice sounding title for Commie Day. You barely heard anything about Seattle in the news and they had the most violent riots so far on the west coast. A Seattle man simply wanted to protect his park and a sculpture within it. 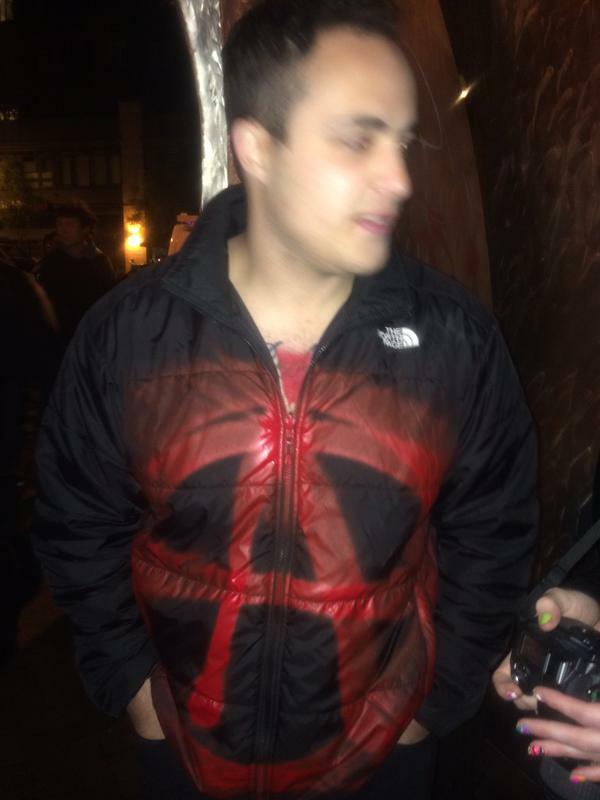 The rioters/Anarchists proceeded to spray paint him instead with their symbol. This after a fun-filled day of throwing bricks, wrenches and whatever they could at the police, who drove them back with pepper bombs and flash bangers. But in social media they blamed the police – funny, I don’t see it that way. 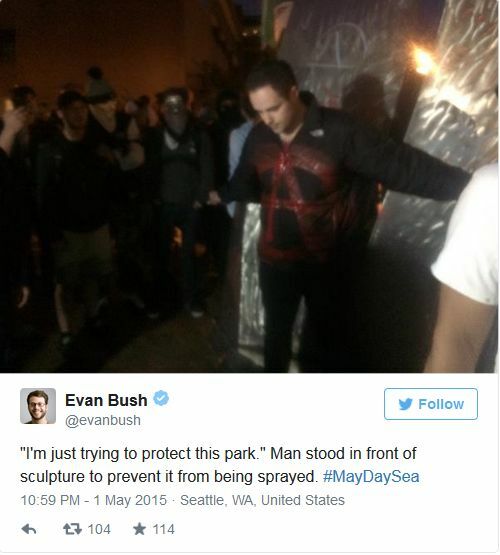 A Seattle man defiantly stood in front of a park sculpture Friday night so that demonstrators could not vandalize it. According to Seattle Times reporter Evan Bush, protesters were going to spray paint the structure when Scott Sullivan decided to take a stand. “I’m just trying to protect this park,” he said. As a result, Sullivan was spray painted by the unruly crowd. Video captured by Bush showed the chaotic scene. At least three officers were injured, two seriously, Friday night when May Day demonstrations in Seattle turned violent. Seattle’s mayor said protesters were seen throwing bricks, overturning dumpsters and wielding weapons. Police ruled the demonstration to be a riot. And this is just the beginning of the American Spring. Think how much fun this will be as it drags on through a long, hot summer. The government will facilitate and make it possible for this to go on and on while they demonize the police and put them and the public at risk. Then Obama will ride to the rescue on his unicorn and nationalize the police by edict. It will be a breathtakingly unconstitutional move and fascist in the extreme. This is the top coming down on America. And those that get in the way such as the young man in the park, well… they’ll go over, around and through them. You’ve got to break a few eggs to revolutionize America it would seem.